The Pack and Go Wizards pack a publication and its linked files into a single file that you can take to a commercial printer, to a photo shop, or to another computer to be edited. Using the Pack and Go Wizard ensures that you'll have the files necessary in the format required to hand off the completed publication to someone who can work with or view it. The Pack and Go Wizard packs the publication differently, depending on the destination you choose. When you pack a publication to take to a commercial printer, you have the option for the Pack and Go Wizard to save your publication as a compressed Publisher file and as a Portable Document Format (PDF) file. A commercial printer can use a PDF file to print your finished publication, provided it needs little or no correction. If you find errors after you hand off the publication to the commercial printing service, the commercial printer can make limited changes to the PDF file. For example, a commercial printer can correct pictures but not text or fonts. The compressed Publisher file produced by the Pack and Go Wizard includes all of the files a commercial printer needs to make corrections and produce the final files for printing. Runs the Design Checker to detect any problems and helps you correct them. Updates the links to linked graphics. Includes the linked graphics files in the packed publication. Embeds TrueType fonts in your publication. Creates a list of any fonts that the wizard can't embed. Creates a report of any problems with linked graphics. Gives you the option to print a composite proof. Click File > Export > Save for a Commercial Printer. If you'll be using an offset printing service, select Commercial Press. If you'll be using a high-end copy shop, select High quality printing. Standard and Minimum size are additional options designed for online distribution or on-screen display only. Click the Pack and Go Wizard button. 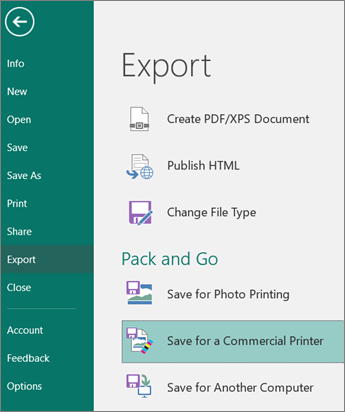 In the Pack and Go Wizard, choose the location where you want to export the file, and then click Next. If you pack multiple publications, save each packed publication to a separate folder. Otherwise, the Pack and Go Wizard will overwrite any pre-existing packed publications. You can save the file to removable media, a hard disk drive, an external drive, or a network drive. If you are taking your publication on disk to the printing service, click the appropriate drive (usually D or E for removable media such as a writable CD or USB Flash Drive). If you are putting your files on an external drive, a network, or your computer's hard disk drive, click Browse, choose the drive and folder that you want, and then click OK.
You can later upload the file to a Web site if your commercial printing service uses file submission on the Web. Select or clear the Print a composite proof check box, and then click OK. The Print a composite proof check box is always selected by default. Use the composite proof to review and catch any errors in a printed version of your publication before you send the file to the commercial printer. If your commercial printer fixes errors in the file, the cost of printing usually increases. Note: If you make changes to your publication after you pack your files, be sure to run the Pack and Go Wizard again so that the changes are included in the publication that you take to your commercial printing service. In Microsoft Windows Explorer, double-click the .zip or .pdf file. Type the path to the folder where you want to save the unpacked files, or browse to a folder, and then click OK.
To open the publication in Publisher, navigate to the folder that contains the files, and then double-click the file with PNG in the name and a .pub extension (for example, publication1PNG.pub). Note: Fonts that are embedded in the unpacked publication can be loaded on the new computer, but they can be used only by the publication in which they are embedded.